This plant has flowered and seems to have developed a green 'thingy' at the top of it's stem. The plant itself seems to be dying. Is this a seedpod and if so, what can I do with it? Can I do any thing with the plant itself? 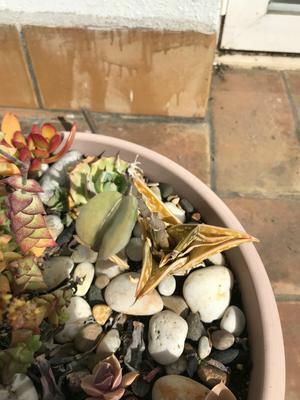 Wow, a triangular plant? That's the one you're asking about? There are so many oddball plants that don't have a name when you buy them and then they do something like this. If it's a seedpod, it may or may not have viable seeds in (some plants need another one to pollinate the seed, so if yours is the solitary one, it might not get that part of the equation). By all means let it dry out a bit more then see if you can split it open - if there are seeds, they'll look like dust. As for the plant, if there was a flower, this might be it for it. Some succulents are 'monocarpic' which means once flowering. It's a normal part of their cycle to flower then die. So, not salvageable, it's finished its destined life span.